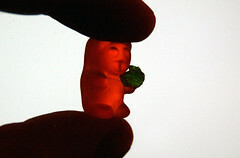 There’s a great gallery on flickr of gummy bears depicting the seven deadly sins. This one here is greed. In more ways than one, it makes me hungry.